The purpose of the exit interview is to provide feedback on why employees are leaving, what they liked or did not like about their employment and what areas of the organization they feel need improvement. 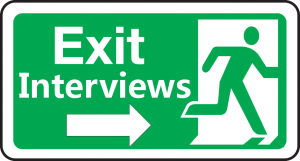 Exit interviews are one of the most widely used methods of gathering employee feedback, along with employee satisfaction or exit surveys. Furthermore, exit interviews can result in the leaver having a more positive view of the organization.